A $75 non-refundable deposit is required to reserve your session. Your session date and time will not be secured without this deposit. In the event of an emergency or bad weather cancellation, this deposit may be moved to secure one additional session date. individual portraits // couples // small families //business & branding // animals // & more! Hannah is not booking weddings or large group family sessions at this time. I am a natural light photographer who is a big fan of capturing genuine smiles and laughter, within the experience of a portrait session. The biggest compliment I can get towards my work is to know that I have made someone see their true beauty through a photo I have taken. I love seeing people interact with their environment and break down any nervous boundaries. I am happy to take photos that connect me with someone on a deeper level, and want to create photos that capture the personality you express. I am a photographer who is learning more about what I do through each person I meet, and every single photo I take. My personal style is consistently changing. To see my most recent work and how I am presently editing portraits, I recommend you take a look at my Instagram account. Most of my work is rather dark & moody, so if you are looking for light & airy portraits, I may not be your gal. WHAT KIND OF SESSIONS DO YOU OFFER? DO YOU SHOOT WEDDINGS? I specialize in individual portrait photography, and my favorite sessions are senior portraits with young women. 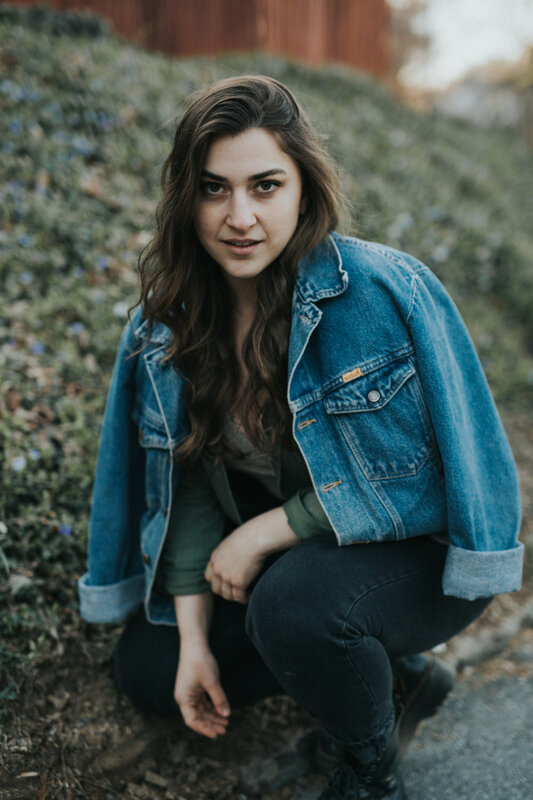 At this time I am happy to offer a variety of portrait sessions such as senior portraits, couples & engagement, adventure, graduation, look books, and business & craft. Portraits are valuable for just about any part of your life. 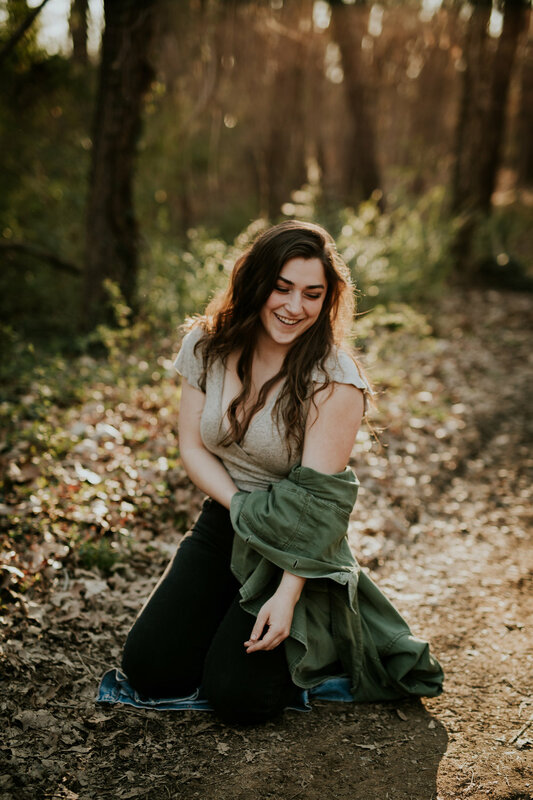 Whether you are looking for senior portraits or some photos of yourself for a dating profile, having photographs that make you feel confident and beautiful is the goal. Give your Grandma a cool new photo of yourself to stick on her fridge! Investing in portrait photography is investing in yourself and your memories! I am not booking weddings or large group family portraits right now. This has room to change in the future and I will keep all information up to date! If you have a photography need that does not fit into any of the described categories, feel free to contact me with a description of how I could help. I am open to new ideas and may be able to recommend a photographer who could be a better fit for your needs! This is a safe and inclusive environment and individuals, couples, and families of any background. Please contact me with bookings at least one month in advance from the ideal time for your session. If you intend to make prints of your photos to use for announcements, please give an additional amount of time in order to have the photos in time. I have a very quick turnover rate between the day of taking photos and the day I deliver them, so I will not work on an additionally rushed schedule. I spend my free time editing and preparing each session. The more time in advance that I am given to prepare, the quicker the delivery will be. I only shoot portraits around the hours of sunrise or sunset. I choose each location for sessions based upon the preference of individuals who I photograph within twenty or so miles of my current home base in the Asheville, NC area. If you favor a scenic, natural style, we can run off into the mountains. If you are a fan of urban settings, I’m happy to play around in the city. I enjoy to shoot in a variety of locations that compliment an individual’s personality. If you have a cool space that feels like the perfect spot for you, let's talk about it! Show me your family farm, incorporate the dog park, get your favorite cup of coffee. It's all about you and your happy places! I will request that we meet on location, ready to shoot. I typically show up 15-20 minutes early, and request that you plan your travel wisely. I am not responsible for a lack of portraits if we lose light as a result of you showing up later than your scheduled portrait time. Thanks in advance for this consideration! I am available to travel for additional costs. I am happy to make necessary arrangements for fun opportunities! I highly recommend that you choose your outfits carefully for photos, but have fun with it! Wear something that makes you feel like you- natural confidence will show as a result. I welcome any level of formality. The most important thing that will show in photos is your level of comfort. Neutral colors- particularly black- are most complimentary in photos. I recommend you stay away from bright tones and busy patterns. Please be mindful of the weather forecast on the day of shooting. Having warm clothing- even if just to be worn between locations- is incredibly important. Statement jewelry adds a nice touch to solid outfits. If you want to wear heels in some photos, I strongly recommend that you bring an additional pair of comfortable shoes as we will do a lot of walking, and the ability to move from location to location comfortably and quickly is key. I recommend bringing a garment bag for your outfits, especially if we are hiking to our location. Please make sure that your attire is wrinkle-free as well! On the day of shooting, I may request that you remove bulky items from your pockets such as a phone/keys/wallet. Please be prepared to stick these in a safe location away from you, and your keys can stay safely in my camera bag if needed. Not sure what to wear? Let's talk about it! I am able to accept cash or checks, and I am in the process of preparing to accept payment over card. Checks may be written out to Hannah Ramirez. Payment in full is due on the day of shooting. Please be aware that absolutely no photos will be delivered until your payment has been received in full. There are no exceptions to this- inquire early if there are circumstances that may fit a discount opportunity. I am very understanding of financial concerns, and appreciate an appropriate amount of time to prepare and arrange a solution for you to receive some awesome photos at a reasonable price! If I have not received payment for any reason, your photos will not be released. 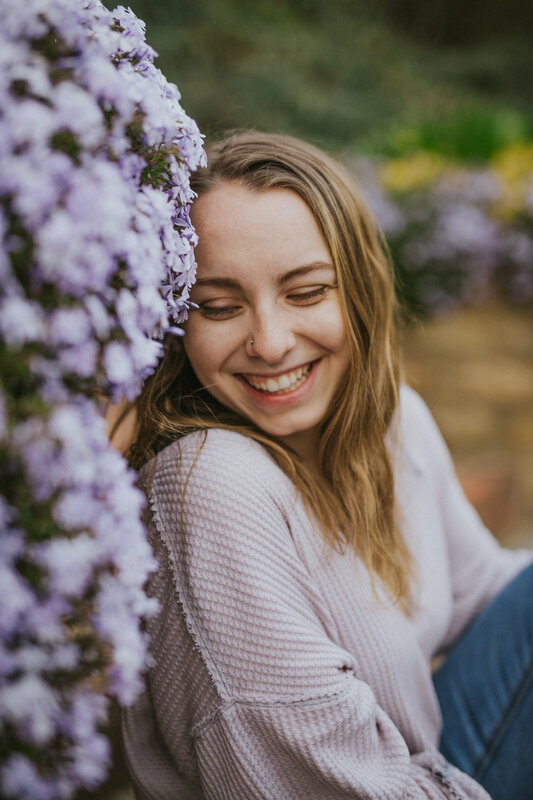 If you are a senior looking to have your senior portraits or cap and gown photos made but money is an issue, let's chat about some other options. Our conversation will be confidential- I'm all about getting you the photos you desire to capture an important time of your life! HOW LONG WILL WE BE SHOOTING? HOW MANY PHOTOS WILL I RECEIVE? I work with the motto of "shooting until we're satisfied" in mind. If this means we knock out a session within one location in 45 minutes, that rocks. If we end up spending two hours walking through the woods and appreciating a big variety of scenery, so be it. Your photo session is not about racing the clock- it's about giving you the ability to enjoy the experience of being YOU while I capture your smiles. When planning your evening, consider travel time and locations. I recommend freeing a three hour window of time from start to finish. I will not be rushed to produce work under any circumstances. If at any point in time during your photo session you wish to stop shooting (or take a break! ), please feel welcome to let me know. Your comfort is incredibly important to me and I want to create a safe and fun environment for you from start to finish. I like to deliver a big mix of photographs with each session. These days, that means an average of 75+ photos per portrait session that you will receive in your gallery. Just like I will not race the clock, I will not be worrying over shutter counts. This is an experience for us to share as we shoot, and it's incredibly worth it in the end. WHEN WILL I RECEIVE MY IMAGES & HOW WILL THEY BE DELIVERED? Sessions do not end for me when we say goodbye- I get so excited to head home and look at the product of our time together. Photos are edited and shared with you within one to seven days. The complete session is delivered within a private online gallery, able to be viewed on a computer or a mobile device. From here they can be easily downloaded in high quality for digital sharing, or be moved to another location to be printed. Click here to view a preview of a PASS gallery! I do not deliver the RAW images from a shoot- there are no exceptions to this. Check out this detailed article from another photographer to understand why. Thanks in advance for understanding! I am a big fan of sharing photos on various forms of social media and blogging my favorite photos as well. A little sneak peek is likely to be found following each session! Please keep in mind that the contract terms of using professional photographs from your sessions requires you to directly credit the photographer for their work when shared on social media. Failure to do so violates contract terms, and WILL stop you from being able to hire Hannah as a photographer again. Crediting artists isn't just nice. It's necessary. Have questions about how to use the photos within your gallery? Let me know and I'll happily share more details! DO YOU OFFER PRINTS? CAN I GET A FLASH DRIVE OF THE PHOTOS? At this time I do not personally provide prints, but you can purchase a print release form for an additional $20 to print them at your chosen location. Printed photos are a valuable way of enjoying your photos for time to come- don’t let the digital world distract you from the joy of holding a photo in your hand! You can order prints directly through the PASS gallery of your photos, but I also recommend: Parabo Press and Zno. A fantastic site for ordering personalized photo cards is Tiny Prints by Shutterfly! If you would like to have a flash drive of your photos mailed to you after your shoot, you can purchase one for $20. Bundle a flash drive and a print release for $30! WHAT HAPPENS IF WE HAVE BAD WEATHER? WHAT IF I NEED TO CANCEL MY SESSION FOR PERSONAL REASONS? A $75 non-refundable deposit is required to reserve your session. Your session date and time will not be secured without this deposit. In the event of an emergency or bad weather cancellation, this deposit may be moved to secure one additional session date. Bad weather happens- not every evening I’m out shooting will be full of glowing light and comfortable temperatures. I will be checking the weather forecast within the week prior to our scheduled session date. I recommend you stay updated as well and consider if there are any hesitations you have about the weather, especially regarding inclement snowy days. Your safety is my priority! Some days are going to contain unavoidable bad weather, and without having an indoor location planned, I will suggest that we reschedule. You will be able to use your deposit to secure a rescheduled date and time if weather was the problem. In the event of an emergency, you may request a reschedule. This includes illness, family emergencies, and an act of God. If it will hinder you from being able to pursue photos, I will refund your deposit in full. I request honesty and will be considerate of your circumstances- things out of our control happen! If you would like to change or cancel your session, I request that there is a seven (7) calendar day notice of changes in order for you to retain your deposit. If you cancel within 48 hours of the shoot, you will forfeit your deposit for that reserved date. The more open you stay in communication with me, the more I will be able to assist you in the event of uncertainty. WHAT ARE YOUR TERMS AND CONDITIONS? DO I HAVE TO SIGN A CONTRACT? You can view my terms and conditions and submit an online form here. Need further explanation regarding one of these topics? Don’t hesitate to ask! I’M READY TO BOOK A SESSION. WHAT DO I DO NOW? Let's get in touch and discuss your ideas! I look forward to hearing from you! If you have ideas but you are uncertain of how to make them come to life, we can bounce ideas off of each other! You are not obligated to commit to booking a session upon inquiring- I want to make sure that I am providing you with the services you are interesting in receiving. I welcome you to ask any questions regarding a photo shoot with me that could come to mind. If you would like a full layout of what the process looks like from start to finish, I'm happy to share. Wondering where you'll change clothes when we're on a hike? If you can bring your dog or a human companion along? Worried you're bound to be awkward in front of a camera? If we can meet before shooting so you know what I am like? Let's talk about it all! If there is a request that I cannot fulfill, I have an awesome group of local photographers I can recommend! Take a peek at my community information page for links to some of my very favorite creative humans.